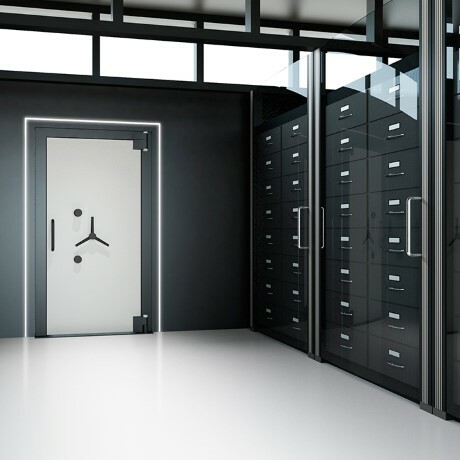 Seal off the modular vault room in your office: Centurion from Chubbsafes is a range of highly graded vault panels and doors providing protection against burglary, explosives and drills. You want a high-security vault panels and door to provide an added safeguard to the modular vault room in your office. But you need a comprehensive solution that can protect you from burglary, explosives and drills. Centurion from Chubbsafes offers protection against burglary (certified by ECBS standards) for grades V to XI. In addition, grades X and XI models provides resistance against powerful diamond-core drill bits (certified by CD classification). Centurion also offers fire properties (tested by MPA DRESDEN GmbH). The armoured door frame and grille gate, accessible via a high-security lock, offer you an extra layer of protection. Choice of 9 models ranging from Grades V to XI.